When you are looking for substance abuse treatment, you may wonder if an inpatient (or residential) center is right for you. 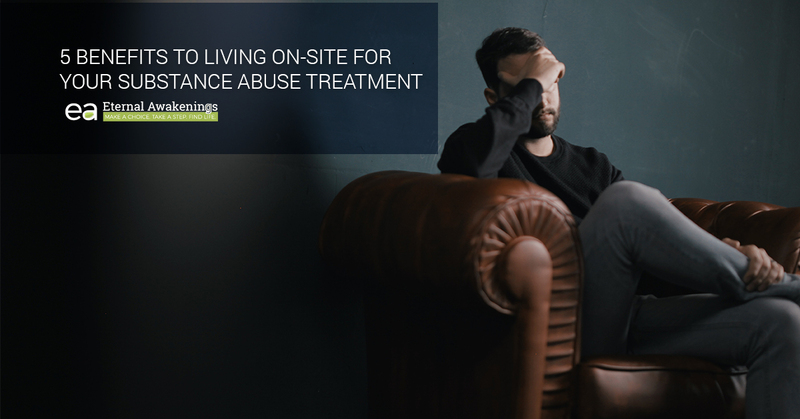 If you are weighing the decision between whether to go to a program where you live on site or one where you stay off-site, we’d like to highlight some of the benefits that you receive when you live at the facility where you’re getting your treatment. Eternal Awakenings offers on-site, residential substance abuse treatment for recovering drug addicts and alcoholics, and we’ve seen these benefits firsthand. However, please keep in mind that while we will be exploring the benefits of attending a program like ours, your circumstances may be different and what’s best for one person isn’t necessarily best for another. The decision to attend an inpatient center truly depends on you, and one of the best ways to find out the best fit for you is to talk to us. Please call 888-672-0298 and we will be happy to discuss your unique situation. One of the most powerful things you can do for yourself is to set yourself up for success at conquering your addiction by removing yourself from the opportunity to use or to drink. The first few weeks and months of your escape from addiction are crucial. If you fall during this sensitive period, you can harm your chances of recovery. However, when you physically remove yourself from your normal environment and enter a substance abuse treatment program, you are effectively cutting off the ability of that drug or drink to get near you. That helps. Getting away from addiction takes focus, effort, and hard work. However, addiction by its very nature tends to leave you in a fog and rob you of that focus, drive, and concentration to push back against that addiction. When you leave your normal environment and change to a completely different one, suddenly, you can’t operate on autopilot any more. You may not realize just how many ingrained habits your brain has developed in your usual environment, like when it triggers you to turn left at that certain corner that leads to the house where you always get in trouble. Sights, smells, pressures, individuals, and places in your old environment can all be triggers that cause you to fall right back into your typical habits. On the other hand, in a new environment, suddenly, you have to pay attention to learn your way around, get to know the new routine, and get used to the people and activities in your daily schedule. Your brain will engage, simply because it has no autopilot mode for what you’re going through. You’ll be naturally more focused and alert simply to get used to your new surroundings. While you might find this to be tiring at first, have confidence in the process and realize that practicing focus is a good thing. It’s making you stronger. It’s developing that focus, attention, and alertness that you’ll need every day as you walk away from your addiction. You’ll appreciate the ability to exert a focused commitment to your recovery, especially when you look back after a period of time and realize how far you’ve come thanks to that focus. When you attend residential drug or alcohol treatment, your counselors are there to make sure that you have a successful experience and get the most out of your period of recovery. You are there to make progress, and the staff can’t help you if they don’t know you. Living at the center, you’ll interact with the staff on a much deeper level than you could get if you were simply attending addiction counseling once or twice a week. There’s admittedly a level of vulnerability when the staff knows you very well. You can’t hide as much. You can’t sanitize the rougher parts of your personality and hope that they never see them. But as uncomfortable as it is to be deeply known, it is a gift. Otherwise, you might begin a program and leave and never quite make it to the deep roots of your addiction that have to be pulled up in order for your recovery to be permanent. 4. There are fewer distractions when you’re onsite. When you’re trying to attend counseling while juggling all the other aspects of your life at the same time, it can be difficult to truly address the topics that will lead to your healing, recovery, and freedom. You keep saying to yourself, “I know that’s true, I know that’s right, but I just don’t have time to implement it right now. As soon as things get a little better/quieter/less stressful, then I’ll really buckle down and work on my recovery.” How many times have you said that to yourself, only to have life speed up and become more hectic rather than less? It’s almost as if there’s a conspiracy to keep you running so ragged that you never have the chance to truly silence all the competing noise and pursue your recovery with the attention it deserves. On the other hand, when you attend an inpatient treatment center, your recovery is not just your highest priority, it’s your only priority. You’re free to give your attention fully to your recovery. Nothing else has access to you. You have a moment of quiet, a season of restful contemplation, a period of time where all the world goes still and you have fewer distractions standing in the way of your recovery. There’s nothing quite like the bond that you’ll form with people who have been there, done that, and who are going through the same thing you’re going through. When you attend a residential or inpatient substance abuse program, you’ll meet other people who are also committed to their own recovery, and you’ll be with them, day in, day out. You’ll laugh together, cry together, do activities together, study together, and learn together. You’ll support each other as you make progress toward recovery. You’ll encourage each other when the road is tough and someone feels like quitting. One day it might be you, and the next day it might be someone else, but everyone shares the core commitment that this recovery is worth fighting for. It’s worth reminding each other what you stand to gain when you finally get the breakthrough you’ve been waiting for. It’s worth pursuing with everything in your being, and when someone is exhausted and doesn’t have anything left to give, it’s worth carrying that person, pushing them forward, and giving them energy to continue. When you’ve been through that with a small group of other people—and when you’ve broken through the wall and you finally start to taste the thrill of victory over your addiction—you have a bond with those people that is hard to break. You will love our affordable, Christian-based program that is based in a lovely, historic mansion in Texas. We have your recovery as our goal, and we’ll walk with you every step of the way as you begin your journey. Contact Eternal Awakenings to start your recovery today.